With 2 days left on our 30-day arrival visa in Thailand, I frantically searched for how to get to Siem Reap, Cambodia from Bangkok, Thailand. Seeing as how Southeast Asia is so well trodden by backpackers, I assumed a cheap and relatively simple bus option existed. Google, and many travel forums pointed me to Tales of Asia, a very detailed guide of how to get from Bangkok to Siem Reap. According to the guide, the trip would cost a maximum of $75 USD if you travelled by land. It could be cheaper if you were willing to rough it more or had people to do the trip with. However, the trip was far from simple. 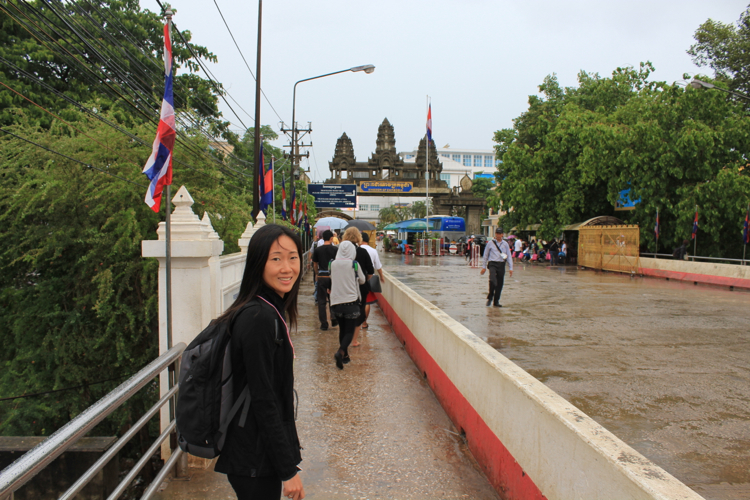 Cross the border into Poipet, the border town in Cambodia. Ignore touts and watch your stuff at all times. I shared my findings with Adam, and he was prepared to follow me through that mess. 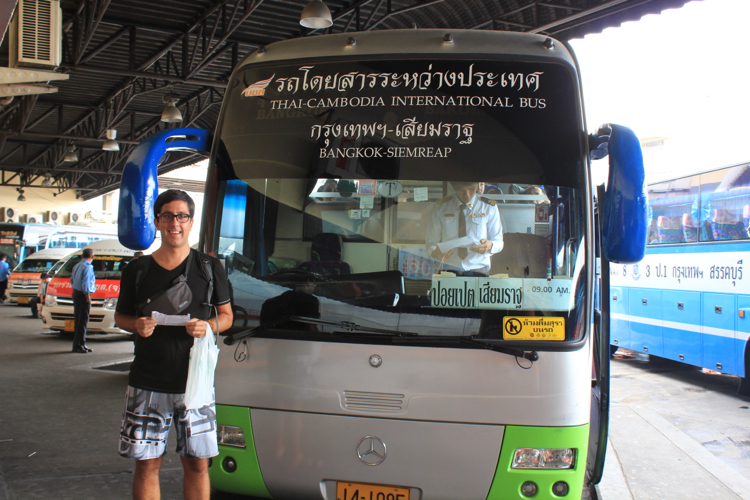 However, curiousity about one leg of the trip led him to the interwebs, where he discovered that there was a new bus that takes you directly from Bangkok to Siem Reap! Apparently this bus has only been operational since February 21, 2013, but several people had shared their experiences on travel forums, so it seemed legit enough for us to give it a shot. Here’s our detailed account of the entire trip. The cab ride from our hostel in Silom to the Mo Chit (Northern) Bus Terminal was less than 10 minutes (we left around 7:20 am), and cost 150 baht ($5.25 CAD). 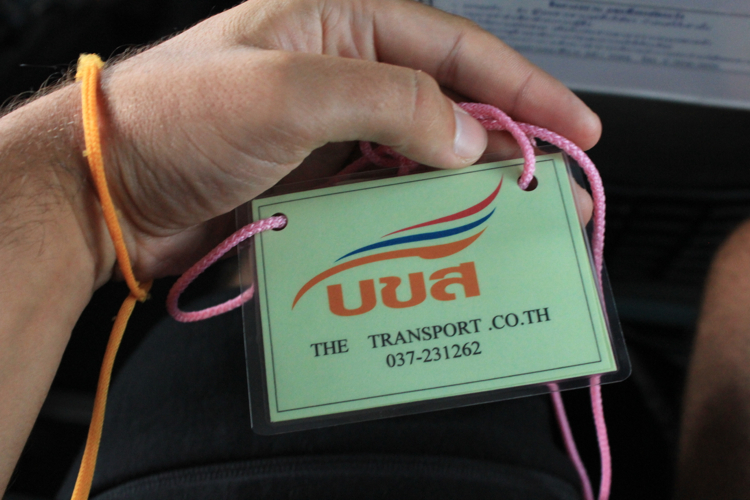 This included 95 baht for the cab ride, 45 baht for an express toll, and a 10 baht tip. Side note #1: A cabby was waiting outside our hostel for customers. 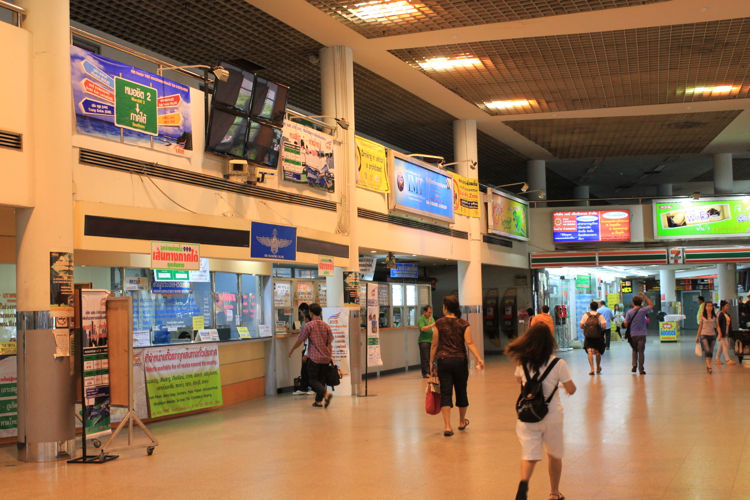 When we asked him to take us to the bus terminal, he quoted us 500 baht ($18 CAD). Adam’s immediate reaction was “f@&# that!” and went back into the hostel to ask how much the ride should cost approximately. The hostel staff said it should be less than 200 baht ($7 CAD). Side note #2: The cabby we ended up going with used the meter, and asked if it was ok to take the express toll road. When we asked how much, the cabby said 60 baht. Once we reached the toll booth, we could see very clearly on a sign that the toll was 45 baht. So Adam confirmed with the cabby that the toll should be 45 baht and not 60 baht, to which the cabby agreed to very quietly. Granted that 15 baht is about $0.50 CAD, which is really not worth fighting over, we simply don’t like being taken for suckers. We would much rather hand over the money as a tip, instead of being scammed out of it. 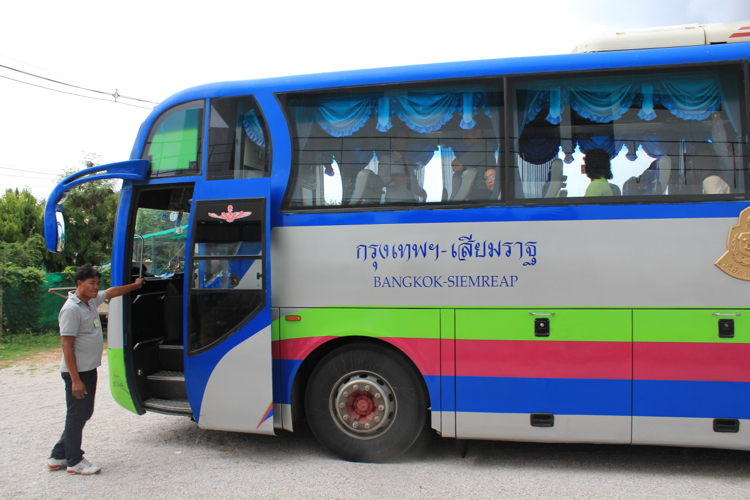 The bus tickets to Siem Reap, Cambodia can be purchased from booth 22 on the ground floor, for 750 baht ($27 CAD) each, and leaves at 9:00 am. We arrived at the station around 7:30 am. By the time we got to the booth, there were only 2 tickets left on the bus leaving that day. We were very, very relieved to have gotten the last 2 tickets! If you want to avoid potential disappointment, I have read that you can purchase tickets the day before to be safe. I have also previously read that there were supposed to be two busses each day, leaving at 6:00 am and 4:00 pm. As at April 16, 2013, the agent at the ticket counter confirmed that there is only one bus each day, and it leaves at 9:00 am. Side note #3: There is a booth 22 outside the bus terminal too. You want the booth that’s inside the terminal, it is a few feet away from the 7 Eleven and has a sign that says “The Transport Co. Ltd.” above. Once we got the tickets, we were free to wander around the terminal, get some breakfast and buy some snacks for the bus ride. There is a small food court, a 7 Eleven and several ATMs if needed. The bus was comfortable enough, not brand new or anything. It was air conditioned and had a toilet on board, which I would suggest using for emergencies only. It was pretty grimy… Your luggage would be stowed at the bottom compartment of the bus, and there is a small overhead compartment on the bus for carry-on items. 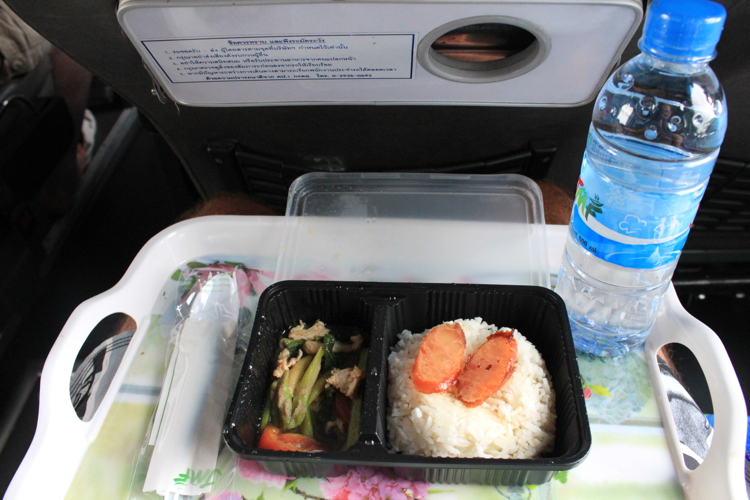 Once on board, a small breakfast was served. 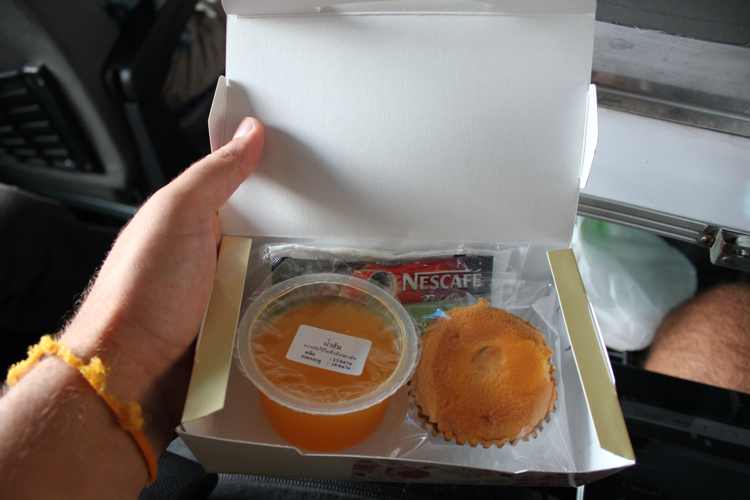 It consisted of a small orange juice and muffin, which was actually very nice and unexpected! Lunch was also served around noon. A small hot meal of rice, pork, some veggies and a bottle of water. Also unexpectedly good. Around 12:30 pm, we stopped by quickly at a market. I assume it was the Rongklua Market near the border. The passengers were not to get off here. We simply saw the luggage compartment open and close, and a few minutes later the bus continued on its way. Side note #4: We’ve seen the luggage compartment open and close a few times during the trip. I was worried that the driver may have been letting people get on and off to rummage through our luggage as I’ve read about that happening with other bus companies. I did not expect this type of activity on this bus because The Transport Co. Ltd. is a government operated company, but I was still a little worried. As it turned out, one of the times the luggage compartment opened was because the driver had a huge fish in a bucket stashed down there, and he needed to add ice to it. Luckily, nothing seemed to be amiss once we got to Cambodia. Shortly after, a Cambodian gentleman came onboard (we will call him “John”) and handed out laminated passes to all the passengers. John said something about how we needed them to get our visas. At 12:45 pm, we arrived at a travel agency. John said we would get our visas here. Adam and I have read extensively about all the visa scams and how easy it is to get one at the border. Apparently it’s so easy that a monkey could do it, provided that it had $20 USD. As such, we could not understand why we were dropped off here, especially because this was a government operated bus, so you would think it should be scam free and go directly to the border. I hopped off to ask how much they were charging for the visa, and was told 1,100 baht if I already had a photo (which I did). That’s ~$38 USD, when the visa should only cost $20 USD. Travel agency for visa applications. 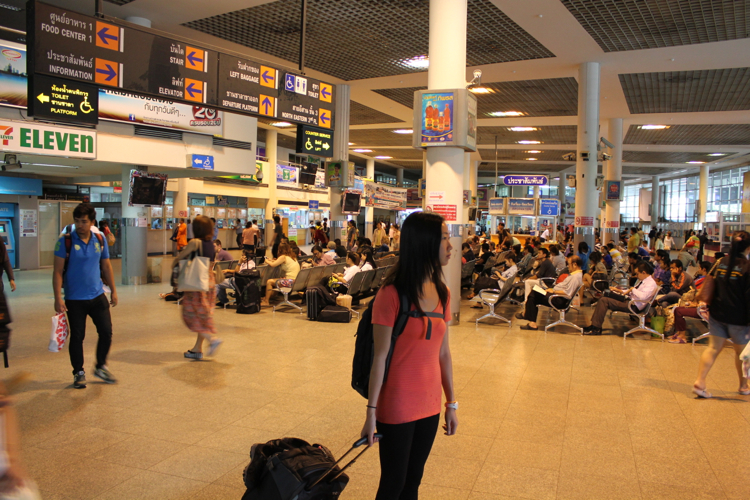 I’m standing there trying to convert 1,100 baht to USD on my phone, while all the passengers funnelled into the office. We spoke to John nicely, and asked if we could get our visas at the border. He said it’s raining and it will be easier and quicker this way. Adam said 1,100 baht is too expensive, and somehow gave John the impression that we did not have enough baht on us. It was then that John divulged the travel agency only accepts baht, so with Adam’s quick thinking, he said we had already spent all our baht and only had USD left. At this point the Thai driver and John said “ok, you can get visa at the border”. So Adam and I waited on the bus while all the other passengers filled out their paper work, and continued to wait even when everyone was back on the bus. At 1:40 pm, one of the travel agents came onboard to hand out passports back to the passengers, and we were on the road again at 1:50 pm. In less than 1 minute, we were at the border. Everyone got off the bus and walked. Side note #5: If you prefer to be prepared, you could get an eVisa online for $25 USD. There is a 3 day processing period. Step 1 is to get stamped out of Thailand which is easy enough. There are foreigner lines and Thai lines. Once that’s done you pretty much walk across the border into Cambodia. Step 2 is to get your tourist visa, which should only require $20 USD, a passport photo and filling out a VERY easy form. The visa office will be to the right of the path that you get ushered through. 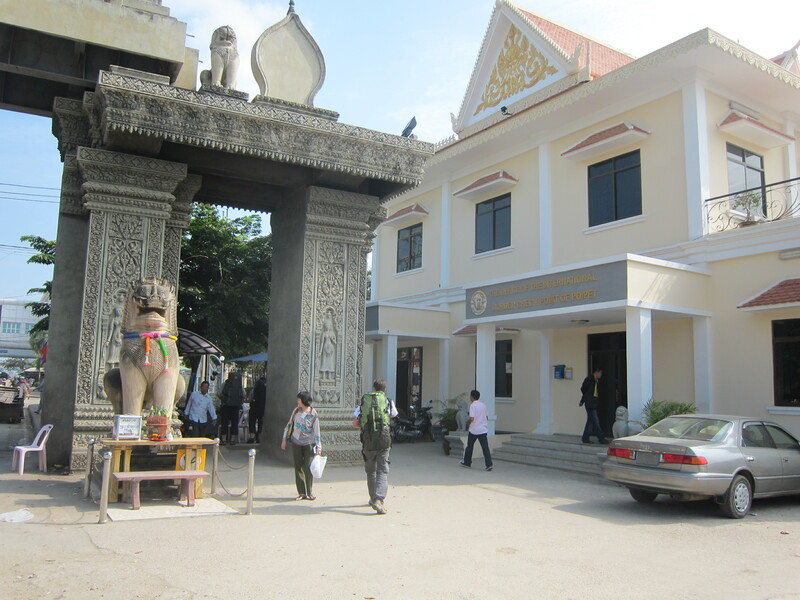 It’s called the “The Office of International Border Check Point of Poipet”. Here’s a picture of what it looks like, stolen from Travelhead2010’s Blog, because we were too rushed and it was too rainy to take our own. 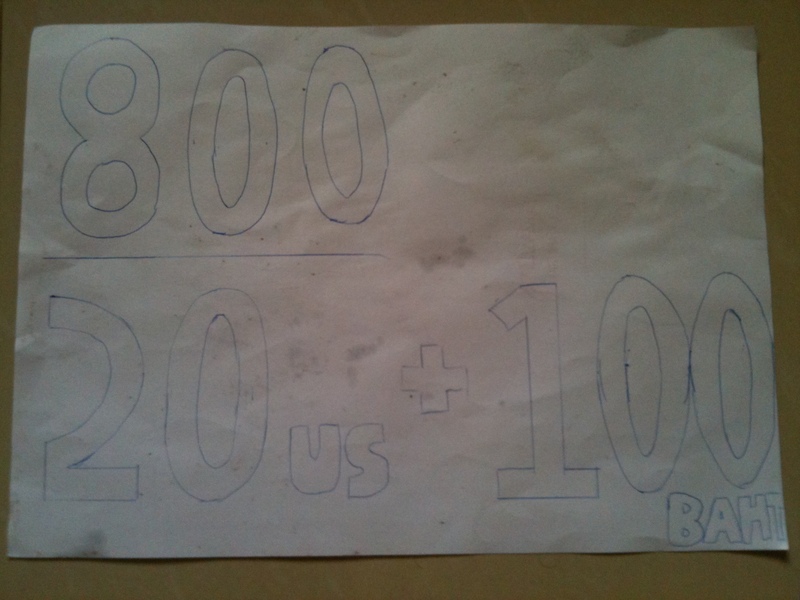 We assume the “800” is for Thai bahts if you didn’t have USD on hand. Right above the counter there’s a proper sign on the wall that says “Tourist Visa: $20 US, Business Visa: $25 USD” etc. So I looked and pointed at the sign and acted surprised about this 100 baht. Then Adam said “We didn’t know about this 100 baht. We don’t have any left, we only have US dollars!”. Both of us played the ignorant and flustered tourist card and it worked quite nicely. The Cambodian official didn’t even put up a fight and our visas got processed just fine (although I must admit I was a little nervous). We may have waited a whole 5 minutes for them, but I should mention that there was only one other couple in front of us at the time. We were in and out in about 10 minutes. Side note #6: We’ve read that it’s not a big problem if you don’t have a photo ready, you simply have to pay a bribe and you’ll still get your visa. A friend of ours also got away with using a coloured photocopy of her passport photo that’s been cut to size. Interesting tip there! Side note #7: While we waited for our visas, we could see a Cambodian guy off to the side of the office with a stack of passports, filling out a bunch of forms. We suspect this is what happens when travel agencies “help” you get your visa. They take your passport, money and photo, and run over to the visa office to fill out the forms for you. We assume the travel agency did the exact same thing with the passengers on our bus. Adam recalled seeing a guy come and go in a golf cart with a bunch of passports back when we were parked next to the travel agency. Armed with our visas, we went on to immigration office, which is about 100 meters further, past the casinos and such. Remember to fill out your arrival/departure card while you’re waiting in line. I would suggest choosing the line with the most foreigners in it, as they seem to get waved through more quickly than the asians. I don’t really understand why that is, so please leave a comment if you know! Side note #8: Pay attention while you’re standing in line. On a busy day, if you look away for one second, you might notice a little asian person standing in front of you who wasn’t there before. We were back on the bus by 2:45 pm, and were the last ones to get on. Despite taking a little bit longer than our fellow passengers because we had to get our visas, this was not what made us slower. We saw people behind us in the immigration office line get stamped in before we did, simply because we chose the wrong line. So don’t worry about getting left behind by the bus if you decide to get your visa at the border instead of the travel agency. After another 2 hour ride, we arrived in Siem Reap at 5:00 pm. 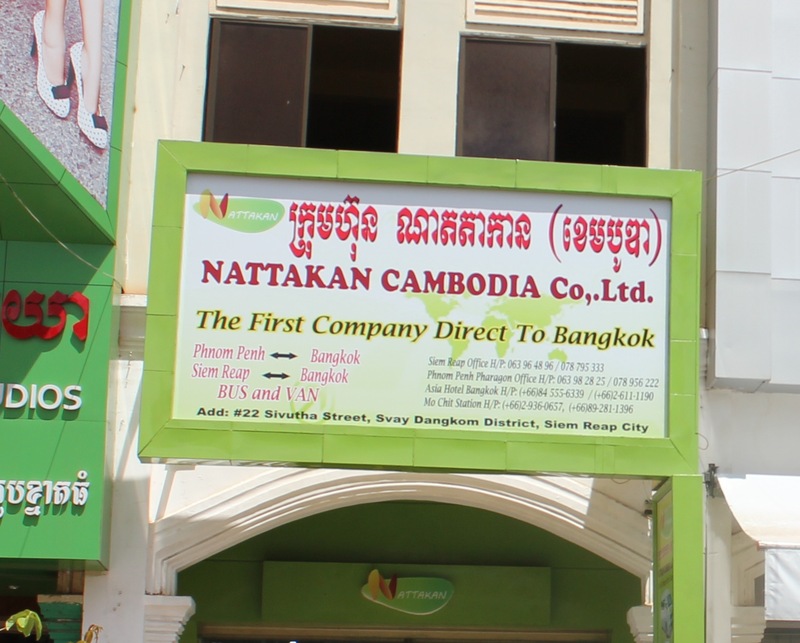 The bus was supposed to drop us off on Pub Street, but instead took us to John’s travel agency, Nattakan Cambodia Co. Ltd., which was at 22 Sivatha Road, or 500 metres north of Pub Street. Not too big of a deal, but we have a sneaking suspicion that the bus driver got kickbacks for 1. taking the passengers to the travel agency for visas, and 2. taking us to the travel agency in Siem Reap, instead of Pub Street. Although it is also quite possible that The Transport Co. Ltd. is involved as well. 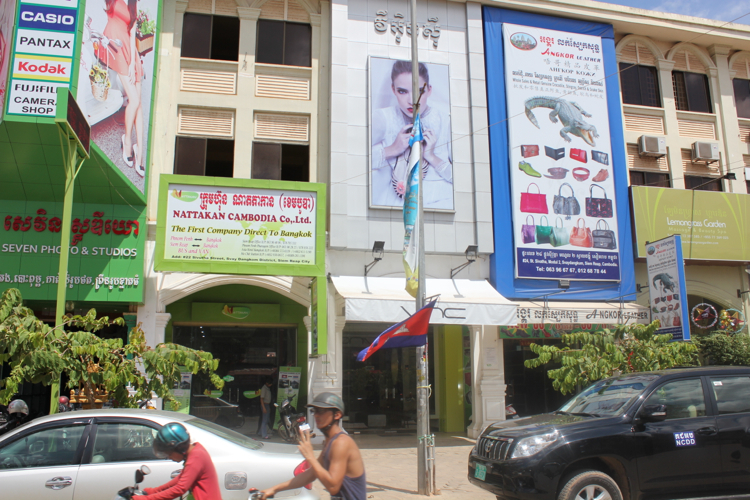 Even though the travel agents were trying to sell us further trips to Phnom Penh or wherever, they were perfectly nice. There was also free wifi in the travel agency office, so we used that to get our bearings. In the end, we used one of their tuktuks to get us to our guesthouse for $1 USD. 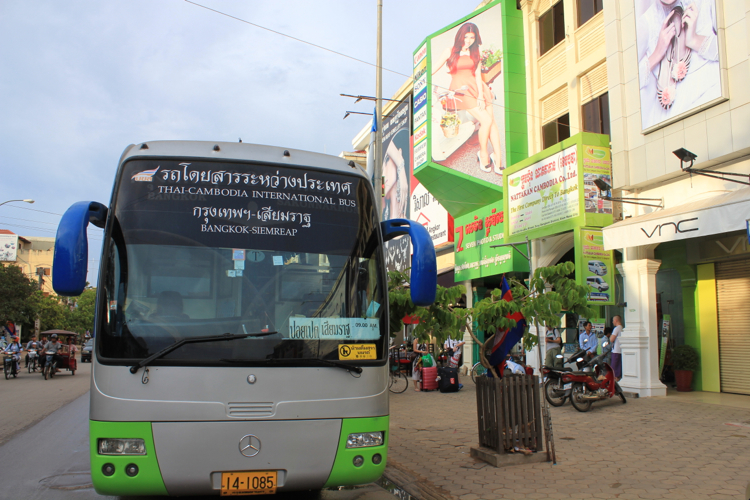 Siem Reap Travel Agency – Nattakan Cambodian Co. Ltd.
Company: The Transport Co. Ltd. The trip went pretty smoothly. We were prepared for any potential scams we may have to face so we were on alert, although it seemed like some passengers were fully aware of the visa scam, but chose to pay double the price anyway for convenience or other reasons. To each their own. Keep in mind that this is a direct bus, so it does not make stops for bathroom breaks or to buy snacks. The light breakfast and lunch were nice, but might not be enough for some people. All in all we were happy with the bus ride and very glad Adam found out about it, instead of having to do the trip with several legs and fight off aggressive touts. We personally have not done this trip from Siem Reap to Bangkok, but it looks like it can be arranged through the Nattakan office we were dropped off in front of. Neil C. described his experience on Trip Advisor. Hi again. I just wanted to put some extra stress again on the fact that you do not need to hand over any money to anyone before actually crossing into the actual border zone. How do you know if you’ve actually entered this area? Seems easy, but everyone on my bus except me and the two aforementioned dreadlocked Australians was fooled. Short answer: if your bus pulls up to a building that you can immediately go inside of and fill out a visa application in without first going through immigration and walking across a bridge to an Angkor-themed gateway, you haven’t “already arrived” at the Cambodian border. 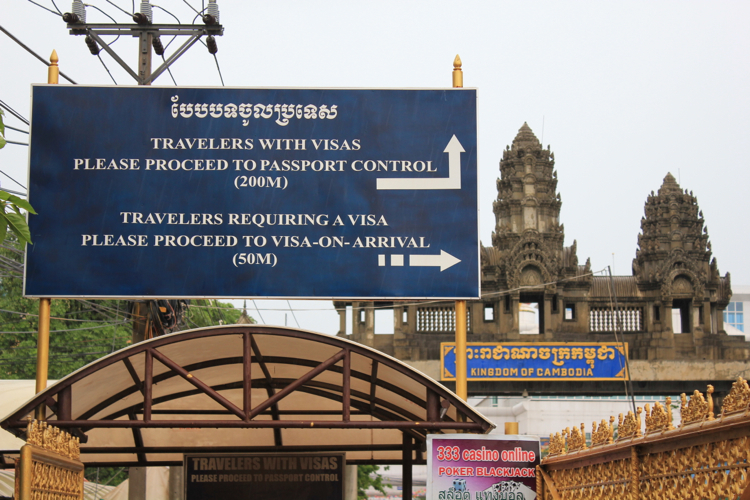 You don’t need to hand over any money at any time to anyone until you’ve crossed that bridge on foot, gone through the Angkor gate in the direction of “travelers requiring a visa,” and entered the Cambodia Visa Office. More details. You know you’re in the actual border area if: 1) You go through official immigration exit procedures, which means standing in line sort of in the same way you do at airports to get your passport stamped by uniformed Thai immigration officers, getting stamped out of Thailand by those officers, and exiting the building on the other side. If there are no uniformed immigration officers stamping people out, you’re not in the border area and there’s no need to hand over any money to anyone. 2) After being stamped out and exiting the building you’ll be at a bridge with an Angkor-themed gate on the other side (pictured in this blog). If you’re not at that bridge and don’t see the gate, you’re not in the border area. 3) You have to WALK (unless you’re handicapped/hobbled/elderly/a truck driver, etc.) across the bridge towards the Angkor-themed entrance to Cambodia. You can’t ride in the vehicle you came in directly to the office where you pay your money and get your visa. 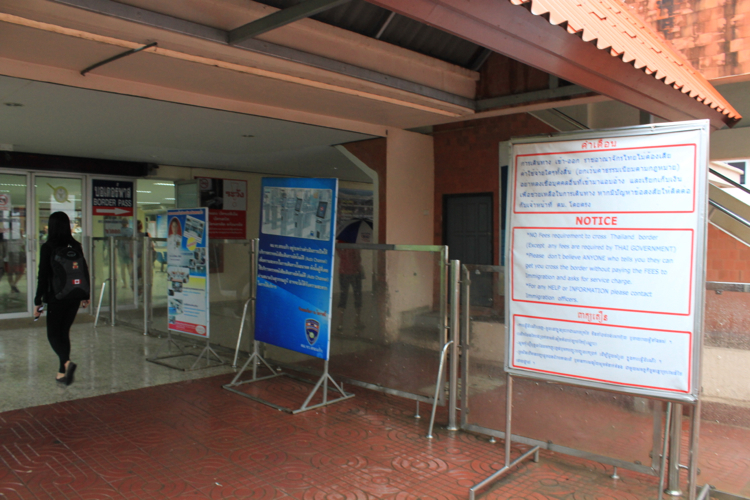 Then, as you describe in your blog, enter the Cambodia Border Visa Office, get and fill out the visa application form, affix a photo to it, and give that form along with your passport to the Cambodian staff behind a glass (plexiglass?) window. Then, and only then, do you need to hand over any money–USD 20–along with your passport and the visa application form. After a wait of a few minutes, depending on how busy the office is, your passport with visa in it will be in your hand and you’ll be off to the immigration line to get into Cambodia (don’t forget to pick up your Cambodian arrival/departure card from the guards sitting near the line). Thanks again for the awesome, informative, and entertaining blog–and congratulations on your marriage! The bus is the same! There’s no changing at the border 🙂 I believe some other bus services do switch at the border, but not this one I’ve written about. Hi thanks for your advice, I have a tricky question. I have dual citizenship so I have two passports with one I want to exit Thailand and then I can go to the bridge and after an hour come back and enter Thailand with my Second Passport . Do you think I need to go to pay the Visa fee for Cambodia. Is this scenario do able at all? Took the bus from Mochit terminal yesterday. Now 2 buses daily, 8am and 9am, fare still 750B. 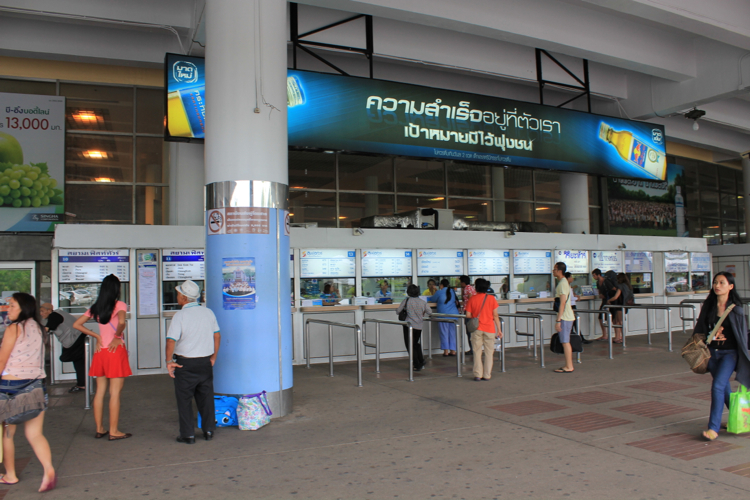 You can buy your ticket from Thai Ticket Major outlets in Central Shopping Centers and don’t have to go out to Mochit. Bus was full so do book ahead. It’s a cambodian bus with Cambodian driver and cambodian license plates so not a Thai government bus. Visa costs now 30$ plus the mysterious 100 Baht, equivalent to 33US $ or 1000 THB at current rate. Cambodian guy on bus now goes from seat to seat recommending his company’s visa service for 1200B or 40$, very openly and a minor surcharge, can’t really call this a scam any more. Not really a big advantage though as you’re still in the same queue at Thai and Cambodian immigration, you get your visa sticker at an office between those two which was quick and easy anyway. On the Thai side after leaving the bus some touts will approach you very self conscious saying need visa here first – just ignore them, you’re in Thailand and need not worry about Cambodian visa until you are stamped out of Thailand. Big trouble was for those who got e-visa YOU MUST PRINT YOUR EVISA OR THEY WILL NOT LET YOU ENTER! They keep the printout for their record so they need it. 2 people had a lot of trouble finding a place to print in between both checkpoints and held the bus up for over half hour. Thanks for the update! Really appreciate it! Took this bus from Bangkok to Cambodia today. 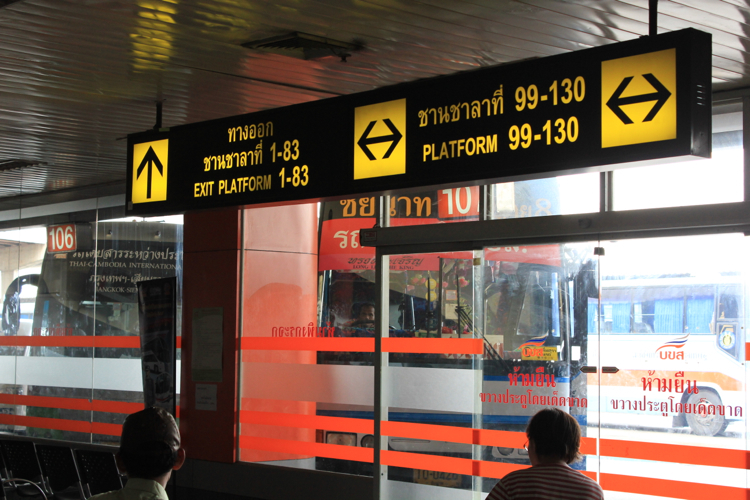 About 2 hours out of Bangkok, the bus stopped at a service station. Once all of the passengers were back on the bus, the bus staff came round with forms for buying a visa through their company. About 10 people on our bus decided to do this, the rest did not. There is no need to do this as it is cheaper at the border. We just told the bus staff that we wanted to buy ours at the border and they were fine with this, so there was no pressure to buy through them. The official staff at the Cambodian border are still showing tourists a piece of paper showing the visa price, which is now $30 USD, plus 100 Thai Baht. 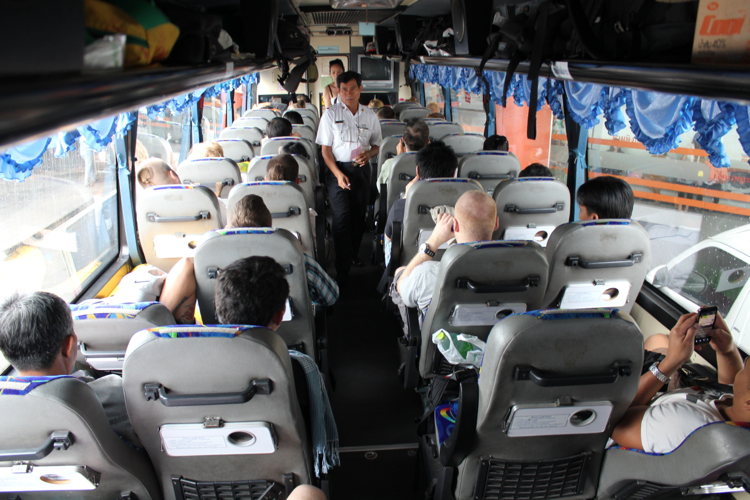 Many people on our bus chose to pay the 100 baht, however we didn’t want to pay the bribe out of principle. We went up to the window with the correct payment in USD but no baht. The official asked us for the baht but we said we didn’t have it and pointed to the official sign which just says $30 USD. The official refused to take our passports and told us to wait to the side, which we did. We waited for a few minutes and then decided to rejoin the queue and try again. We then handed our passports to the same official. He again asked for the extra money, but we just gave him the $30 USD and no baht. 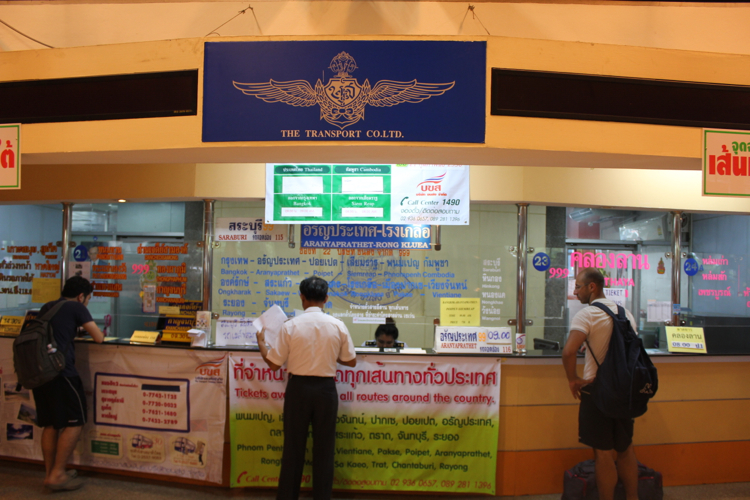 He then took our passports for processing and 5 minutes later we received our visas without paying the 100 baht bribe. Thanks for posting the detailed step by step guide Julie- it was really helpful throughout the journey! 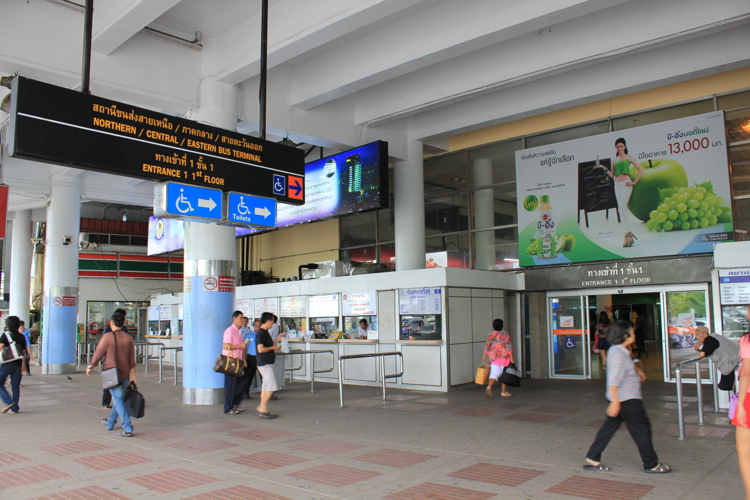 February 2015 – there are now two buses daily; departing at 8:00 a.m. and 9:00 a.m. We arrived at Mo Chit bus terminal at 7:00 a.m. Tuesday and there were six seats available on the 8:00 bus. Tickets are still sold at window 22 (as well as 20 and 21) _B750 each. The ticket sign has changed and is no longer yellow, now white. Another big change is the policy towards visas. We were not asked, forced, encouraged or even suggested to purchase visas through the bus agency or any agency associated with the bus company. In fact we were given no instructions or advice about visas. When the bus got close to Thai passport control they parked and let us off and drove through and parked slightly before the area you exit after Cambodian passport control. So we had to back track to get back on the bus. Visas are issued at the office on the south side of the road. Cambodian passport control is a complete mess. It was nearly two hours waiting in line with three of four booths open. 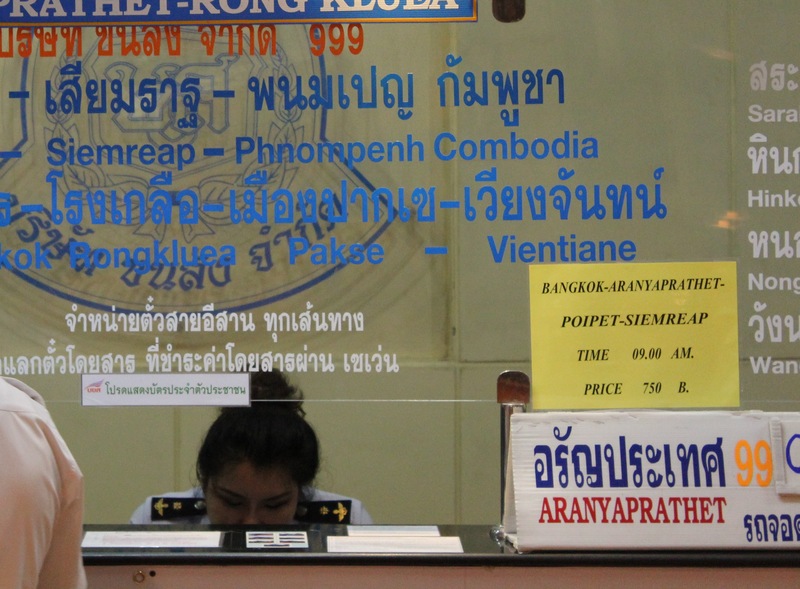 The Cambodian immigration officials have an inefficient process and clearly couldn’t be bothered to do anything other than take their time. It was two hours 45 mins between drop off and resuming the bus trip. The post above refers to the bus as a Thai government bus. In our case, I don’t think that is true. The bus had Cambodian writing on it and I believe the driver and three (practically useless staff) were Cambodian. The bus was air-conditioned but either turned down or unable to cool. I estimate the temperature inside the bus at 80 degrees for most of the trip. Overall the organization and conduct of the operation were pathetically poor by developed country standards. Perhaps the 9:00 bus is Thai operated. If true, i’d take it. Thanks Julie and Adam for this detailed account. It was very useful for anticipating our trip across the boarder. I still want to know that the re-entry permit service is available on the border because we have to come back to Thailand as we are working in Thailand. Congrats on the awesome post. Just wanted to inform readers that a new online ticket website http://www.Camboticket.com has been launched for travel within Cambodia and to/from HCM and Bangkok. I have used this a few times and have found it super useful. You may want to add this to the post to make it useful to readers. Thanks for this awesome advice! Really helped us through the border. We had an e visa and just wanted to post a little about this and how they tried to scam us with that. We got to the border and everyone told to get off for the border. There were guides there asking about visas, so we said, no thank you, we already have ours. They then tried to tell us (quite forcefully) that we needed a departure card to get the stamp into cambodia. 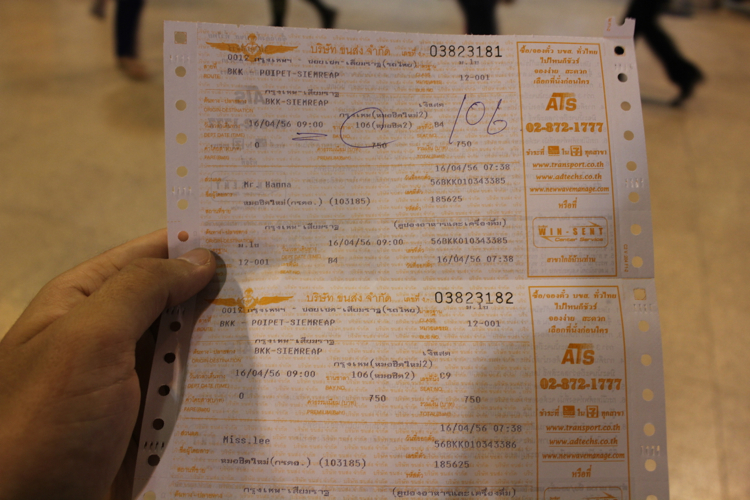 They tried to charge 200baht for filling in the card for us! We said we didn’t have any baht but that we would come back as they were getting a little angry when we questioned this. Hoping we had made the right call we went to the Thai departure point, then walked under the arch, past the casinos just as described. On the right was the Cambodian border point, where we walked in and was handed one of the departure cards by one of the guards. Filled in and got our stamps really quickly no problem, feeling pleased with ourselves that we didn’t fall for that scam! Thanks again for the detailed post and hope this info can save people spending 200baht on a piece of paper that you get given for free! Nice and comprehensive information. I am an Indian traveling to Cambodia in June from Thailand. I have my e-visa, so kindly suggest me a cheap option of traveling. I am told government buses plying to cambodia is a cheaper option. do you have any idea.